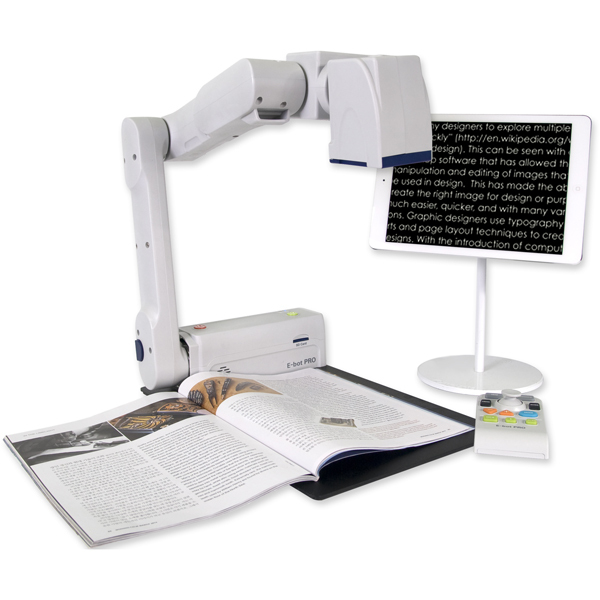 Connect E-bot PRO to your iPad™ or Android™ tablet, Mac™ or PC to view and interact with your reading, writing or distance magnification image. Navigate your reading material smoothly and easily using joystick control or touch-screen gestures which move the camera in response to your touch. Use E-bot PRO to read a book, see the whiteboard or take notes in class. OCR scan a full page of text, then listen to it read aloud through a built-in speaker or headset (speaker jack available for earphone or headset). OCR capture an entire page then listen in either a male or female voice as well as set your speech rate and volume. E-bot PRO features a secondary, dedicated camera for OCR that ensures a great-quality scan whether in a classroom, office or home environment. OCR and save pages from a textbook, newspaper or magazine, capture and save an image, or record a video of the teacher writing on a whiteboard or a display on a smart-board. Bring E-bot PRO wherever you want to use it. E-bot PRO is lightweight and easily folds into a compact size. * Exclusive iPad and Android Tablet Compatibility – Completely Wireless! Display E-bot PRO’s image directly on your iPad or Android tablet. Quickly and effortlessly connect your tablet via a dedicated Wi-Fi connection, without any wires or cables! This reduces desktop clutter and tangled cables. View a book or document on your desk or a presentation on a board or screen across the room. Switch between the two without losing the respective magnification level, image setting or display contrast in reading or distance view. Increase or decrease the zoom level, change text and background color, adjust contrast, initiate an OCR scan, pause and resume OCR text-to-speech reading, and more using familiar pinch and swipe gestures. This intuitive user-interface means anyone from elementary school students to seniors with vision loss can learn to use E-bot quickly and with very little instruction. An integrated light sensor automatically detects the light in your surroundings and adjusts for a clear, high-contrast reading or writing image. Use E-bot PRO for more than 4 hours on a single charge. All functions are available via an intuitive wireless remote control that features a multi-speed joystick to control the camera movement To read across a line of text or pan around a classroom or conference room in distance view. Use the built-in OCR to capture and read documents even without a PC or tablet attached, and listen to text read aloud using E-bot PRO’s built-in speaker.